Born and bred in the Vaal Triangle, Dewald (37) is not only familiar with the local rugby scene, but also in the best possible position to identify and nurture young talent. As a firm believer of Ellen Johnson Sirleaf’s quote, “If your dreams don’t scare you, they aren’t big enough”, Dewald is excited about the challenges that comes with the responsibility of being head coach. “Ever since I can remember, I have dreamt of competing against the top coaches in the Varsity Cup competition,” says Dewald and adds that his teams’ performance will ultimately bear testament to his skill and ability on the rugby field. Dewald’s coaching career took off in 2000 at Hoërskool Transvalia in Vanderbijlpark. He boasts a IRB-level 2 coaching rating for the 15 man version of the game, as well as a level 1 coaching rating for sevens rugby. A highlight of his career thus far is being part of the NWU-team who won the Valke under 21 Peregrine League in 2014. He also groomed the Valke under 18 academy team, the Valke under 20 Currie Cup team and the Valke amateur seven’s Team. In 2016 he was awarded as Gauteng Sport Coach of the Year as well as the title of Sedibeng Coach of the Year. The latter achievement was also repeated in 2017. Joining Dewald and Sean McCallaghan, NWU sport manager, at the helm this year will be Gunner Williamson (coach: forwards), Kazlo Holtzhauzen (coach: kicking) and Marnus Erasmus (coach: juniors). * The NWU Rugby Institute: Vanderbijlpark club trains from 18:00 to 20:00 on Mondays, Tuesdays and Thursdays. The club’s gym sessions run from 05:00 to 11:00 weekdays. The teams will play their first friendly match on 23 February and their first league game on 30 March. 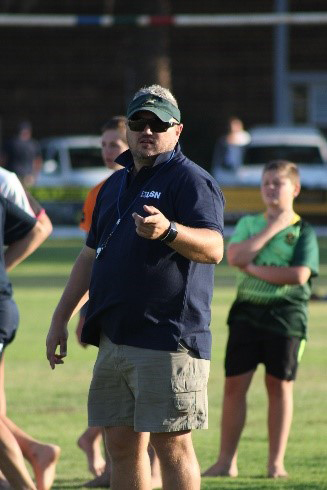 Dewald Pieters, or “Coach D” as he is known, will head-up the coaching structure at the NWU Rugby Institute: Vanderbijlpark.